Inspiring Environmental Education | Live Healthy S.C.
Environmental education projects develop students’ awareness of the natural world and their impact in it, as well as encourage lifelong environmental stewardship. 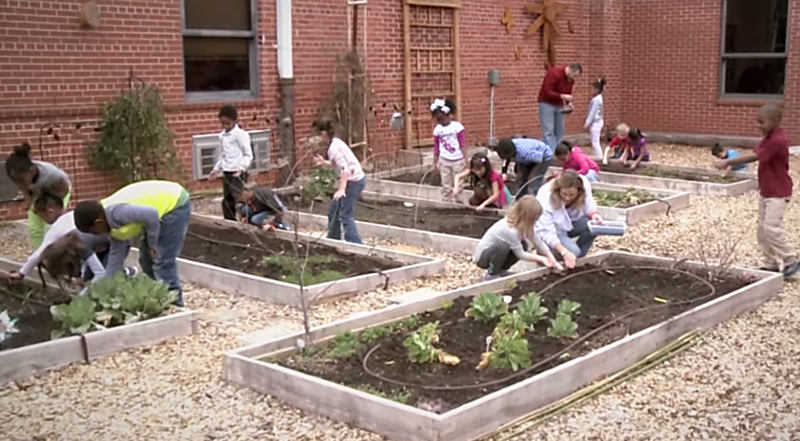 Engaging students through hands-on projects such as cultivating a classroom garden, constructing a recycled bottle greenhouse, and charting the progress of a recycling program creates a sense of ownership and excitement for their work. Leaphart Elementary students developed a watershed management plan. Prevent or reduce pollution by promoting a beautification/ litter pick-up program, starting an anti-idling campaign or implementing a storm drain-marking program. Restore or preserve a natural area by enhancing a particular habitat, improving water quality in a pond, providing food and shelter for different species, or managing stormwater runoff to prevent erosion. Make your school more water or energy efficient by installing rain barrels and water-conserving gardens, or using alternative energy to power your school’s lawnmower. Utilize a novel approach to address a common issue by installing compost tumblers, harvesting rainwater or providing waste free lunch kits to reduce garbage. 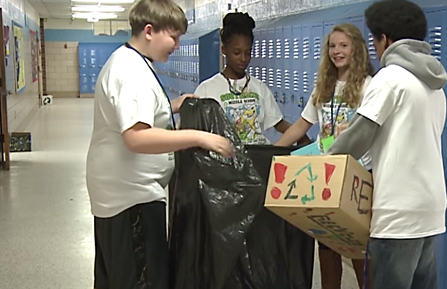 Southside Middle School launched a recycling program. DHEC’s Champions of the Environment Grant program promotes environmental education by providing monetary awards to K-12 teachers and students for their outstanding environmental projects. Up to eight projects are awarded each school year and Merit and Seedling awards are available for helping smaller projects get started. Grantees are also featured in a 30-second TV commercial and their project is highlighted on the Champions’ website. Champions is supported in part by International Paper and SCE&G. Visit the Recent Grant Winners page to see what others have done, and visit the Advice & Ideas page for suggestions for successful projects. To apply for a Champions’ grant visit www.scdhec.gov/champions and electronically submit a completed grant award application. Applications are due October 15 and awards will be made in November. Ebinport Elementary enhanced its classroom garden through increased composting effectiveness, organic protection from pests and frost, space utilization with vertical gardening, and indoor seedling growth. Be a Champion! Do your part for the environment! This entry was posted in Environment and tagged Champions of the Environment, education, Environment, grants, K-12, School projects on September 22, 2015 by SC DHEC.